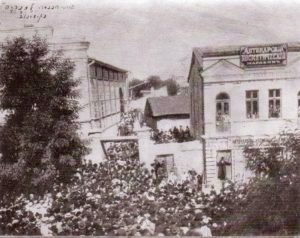 Every April is not only the time of Spring but also memorial days of the tragic events of 1903 that made Chisinau despondently famous in the world. 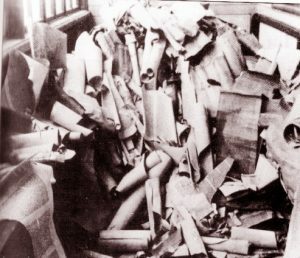 During the pogrom not only Jews became the victims but also their sacred values – Torah scrolls – were desecrated. Here you can find the newspaper “Novosti” article about burying ceremony of desecrated Torah scrolls. “On July 24, the burial of the Torah scrolls parts, scorched and desecrated during the pogrom took place. 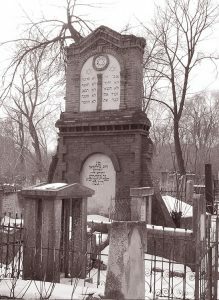 On the eve at 12:00 the synagogue on Pavlovskaya Street, where the scrolls were kept, was crowded by the Jews who mourned the desecrated relics. Only at 11 p.m. the crowd dispersed to their homes. On July 24 from 5 a.m. a large unit of policemen blocked the quarter of Pavlovskaya Street, where the synagogue was located, and traffic on this quarter was completely discontinued. On the initiative of representatives of the local Jewish community and rabbis, 10 urns were prepared, into which the parts of the scrolls were placed. The urns were laid in pairs in five stretchers specially designed for this purpose, upholstered in black cloth, and were covered with embroidered gold and silk coverlets, which depicted the 10 commandments. Exactly at 10 a.m. the funeral procession moved from the synagogue. On both sides of the street, up to the cemetery, a chain of young Jews was set, the stretchers with urns were carried by the disciples of the local Yeshiva, followed by a twenty-thousand crowd of Jews in silence. But when the procession approached the cemetery, the crowd erupted with a loud cry and moan. In the cemetery, near the place where victims of the pogrom rest, a crypt was erected, into which urns with scrolls were laid and the entrance to this crypt was covered with earth. The article from the newspaper “Novosti” is (presumably) from the fund of the well-known Russian lawyer A. S. Zarudny (Fund No. 837.0.1, D.1387, L.9., Podlinik), stored in the Russian State Historical Archives. The Foundation is composed of letters received from another well-known Russian lawyer, a prominent Jewish public figure O. Gruzenberg, and from the Chisinau lawyer L. Goldenshtein during their joint work on the pogrom of 1903, copies of indictments, sentences, cassation complaints in court cases on this pogrom, cuttings from various newspapers of that time.